On today’s post, I am sharing both a World Map Art project and the silhouette cut files for free! This wall art went in my son’s bedroom and can be made in any color combination. I just had to give my son a homemade gift for Christmas for his bedroom. 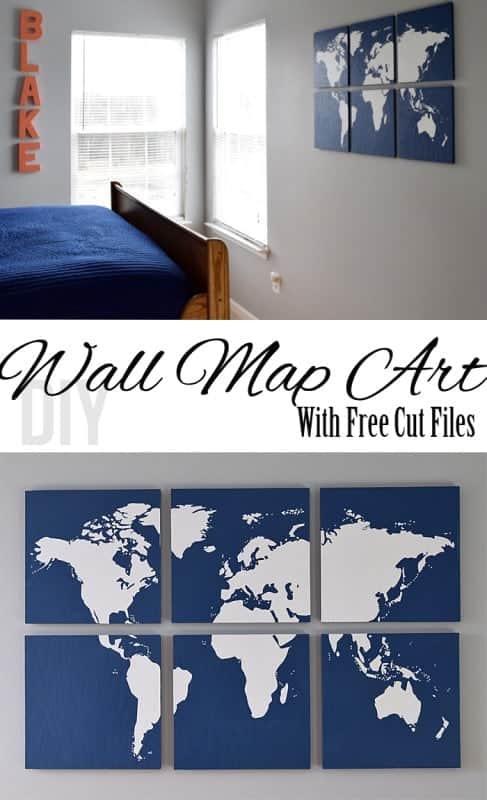 We are going bold and graphic in there so this World Map Wall Art was perfect. Map art is trendy but he is really into maps and globes right now. As a mama, that makes me so proud! First, I started off with a sheet of plywood that my husband cut into 12″ x 12″ squares, 6 of them in total. I primed and painted them blue for the ocean. I painted the sides blue as well. I created a world map and sized it to the appropriate measurements in Photoshop and chopped it up into six quadrants. You can do this in Pic Monkey also. I cut the world map out using my silhouette and vinyl sheets. Unfortunately, I didn’t have enough white vinyl so I did it in brown. I positioned each quadrant as shown above, by gently peeling, rolling under, and pressing the vinyl down. After all the vinyl was properly positioned, I painted the white continents with a roller. After 2 coats, I peeled the vinyl off gently. To hang the map art, we used velcro command strips. One side attached to the wall and the opposite side attached to the board. Then they velcro together. Now I really need some curtains for that boy’s room. I would love to hear if you have a project using these cut files. I would love to see it! Updated: Due to requests for the wall map art files, I have decided to add the files as a PDF format in addition to the cutting files (links to those are mid post). Simply right click, and save as. These files are 12×12 inches which is an odd printer size. If you are unable to print them at home, I have checked with stores such as Staples, Office Depot, and UPS and you can print them as 12×12 for around $5 or less. Simply save them to a thumb drive or other portable storage device. In the case of Staples, I know you can upload the files to their website and ask for in-store pick-up. They do NOT need to be printed in photo quality since they are only black and white line drawings. How does the vinyl come in to play? Did you have this printed on vinyl? I’m confused. I can where the confusion is. The vinyl is what I used to make a stencil, basically. It has an adhesive backing that will stick to the wood and is easy to peel off (without pulling the blue paint) when the project is finished. I cut the vinyl myself with a silhouette cameo machine. However, not everyone one of those available to them and that is probably where the confusion is from. If that isn’t available to you, an alternative method is to print the PDF files on a different medium (12×12) or take the files to a print shop and have them printed on an appropriate medium for stencils. Hope that clears it up and if you have any other questions, feel free. That is a great idea! I am sure you are so proud of him and it shows! Wow, that wall art is absolutely awesome!! I love maps so I’ll pin it for later, thanks for sharing!! this.is.AWESOME! I canNOT wait to try it. Thank you for the files! I really enjoyed this post so much! I am thinking about re-creating it as a gift for my boyfriend who loves to travel. I want to make it perfect so I was wondering exactly how you transferred the silhouette to the vinyl and cut it out so perfectly?! Yes, I do love it, obviously, but don’t worry if you don’t have one. The first set of files (the .studio ones) are files specific to that machine, so I added the PDFs at the bottom too for reprint. I would recommend cutting it with a craft X-acto knife rather than scissors. You will get a cleaner look. And honestly, it doesn’t have to be super perfect. No one will notice if you miss a few islands off of Alaska or that Russia isn’t perfect. Great project! Thanks for sharing it at The Pin Junkie! 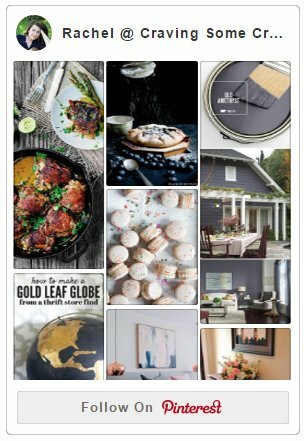 I’m stopping by to let you know that your map wall art is being featured today in a roundup of home decorating ideas. Thanks, Bonnie! I am totally thrilled. Heading over to share now. I LOVE this!! I am planning to put this together (on canvas) for a room we are preparing for foster care. Our theme is navy and yellow so this should fit right now! I cannot open the .studio3 cut files… could you send them or post them as PDFs?!?! I am hoping to use them!! Thanks! I LOVE this! I love how the orange letters pop against all that blue, as well. I definitely need to try something like this! Thanks for stopping by, Chelsea! We are going pretty bold in his room with the colors. I love that I can get away with it in a boy’s room. I feel like we’ve talked about my obsession with maps for decor before…but in case we haven’t, I am so with your son on this! I LOVE IT! You did a knock out job (with his entire room, and the house, and everything you touch)! I am pinning this!!!!!!!! His room still has quite a few projects to do yet. Like refinishing and painting all of the furniture. You know me though, more projects than time. But I will get to it eventually. For now, he totally loves his map. And he got a globe that lights up with constellations at night. How cool is that? What a great gift! I’m addicted to making wall art with my Cameo, definitely pinning for later. Visiting from the Weekend Retreat link party. Thanks for the pin and I am glad to hear someone else loves working with their Cameo. Best craft investment ever I think! That looks amazing! I would love the files in PDF version please. Thanks! Can’t wait to make this! Wowwwww that is awesomeeeeeee! Could I please also have the files would love to make one myself? Thank you so much for sharing! This is fantastic! I want to do an explorer room for my boys, I think I map like this would be perfect. Now I just need a silhouette. Thanks. I love this idea! I just saw your link at the link party palooza and love your wall art. Thanks for sharing. I love this. I have a silhouette too & I also love it. I can’t figure out how to get it to cut sometimes though. I have no idea what i’m doing, haha. Loving this! Wish you lived closer and could give me a Silhouette tutorial. Awww, your so sweet, Erlene! I have had a silhouette for like 10 years. What attracted me to it was the ability to make my own graphics like this so if you ever have any questions, feel free to ask. The only thing I have not done a whole lot of is the print and cut feature.